This was an excellent week for The Library at Winkelman Abbey. First up is the latest issue of Pulphouse Fiction Magazine, followed by the latest issue of Apex Magazine. Both of these are the results of successful Kickstarter campaigns. Next are the two latest books (Tentacle by Rita Indiana, Slip of a Fish by Amy Arnold) from my subscription to And Other Stories. On the top right is Ink by Sabrina Vourvoulias, from Rosarium Publishing. The entire bottom row is my first shipment from Ugly Duckling Presse, to whom I subscribed back in July when I had a little extra money and no immediate household needs. From left to right they are Orange by Christine Herzer, Wolfman Librarian by Filip Marinovich, This Window Makes Me Feel by Robert Fitterman, Feeling Upon Arrival by Saretta Morgan, Defense of the Idol by Omar Cáceres, and Dear Angel of Death by Simone White. All are poetry, and all are beautiful editions of beautiful writing. 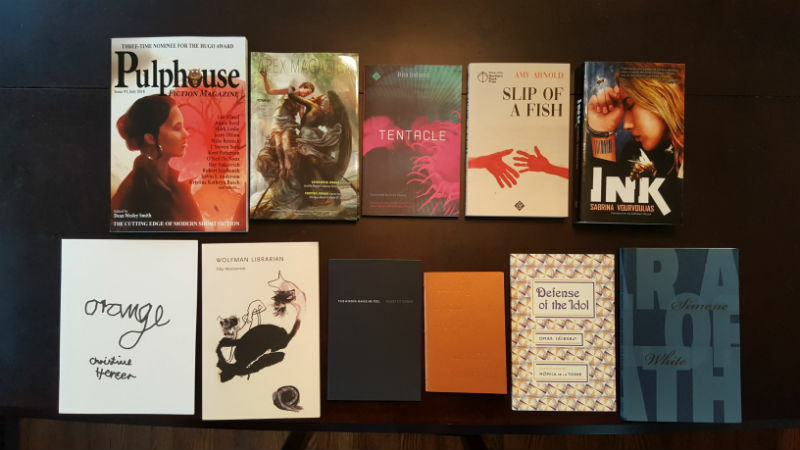 Once again, this week’s haul is made up entirely of books from independent publishers. Save for Ink, all are part of annual subscriptions. If Rosarium ever offers a subscription to their catalog, I will be the FIRST in line to purchase one.